It is with great sadness that the MS Society SA/NT mourns the passing of Ruth Ziegeler who, after a brief, hard-fought battle with a very rare form of cancer, passed away on Saturday 14 April at the age of 48. Ruth was an amazing supporter of the MS Society and an inspiration to so many with her commitment to, and involvement in, the annual MS Mighty Swim (formerly Mega Swim). She has been integral in the creation and organisation of the event since its introduction to South Australia in 2006. The original concept of the MS Mighty Swim was initiated by Carol Cooke, a Victorian Masters swimmer living with MS, to raise money for the Go for Gold Scholarships which gave people with MS the opportunity to pursue a dream. In more recent years, the fundraising has supported a wide range of other services including exercise and hydrotherapy for MS Clients, along with a range of services designed to help people live well with MS. Over the event’s 13-year history in SA, the MS Mighty Swim has raised over $750,000 to support people with multiple sclerosis in SA and NT. During the first few years, Ruth and the Atlantis Masters Swimming Club voluntarily coordinated and managed the entire MS Mighty Swim event. Ruth also donated her time as one of the judges for the Go for Gold Scholarship, while simultaneously coordinating and swimming for her own team—the Atlantis Masters—for the past 13 years! She swam at this year’s Mighty Swim, staying overnight for the full 24 hours, only a few weeks before her cancer diagnosis. The MS Mighty Swim epitomised Ruth’s commitment, energy and achievements. She was humble, capable, wise and caring. She had a way of making everyone feel included. Her colleagues from the Atlantis Masters Swimming Club shared their admiration of Ruth’s persistence and patience when coordinating their team each year. While it was always difficult to coordinate a large group of people, she’d turn it into a neat timetable with all timeslots and swimmers included. Each year, she would be at the event for the full 24 hours swimming, counting laps, or just encouraging others—always with a smile. 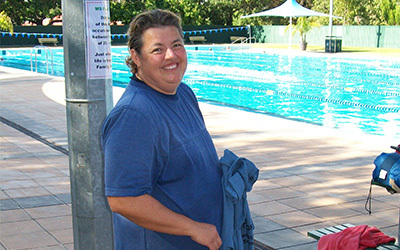 Ruth’s commitment to the event contributed to the MS Mighty Swim winning an Unley City Council Community Event award. Her contribution was also recognised when she received the MS Society’s most prestigious award, the Renee Thonard Award, for her contribution to the MS Mighty Swim and the difference it had made to the lives of people with MS. The MS Society would like to acknowledge the service Ruth provided to people with MS, and her exceptional commitment and contribution to making the MS Mighty Swim a success.